You can create your own customized editable version of this contract document using Proposal Kit Professional. Follow these steps to get started. Use the Release of Legal Hold Notice Form to provide notification to the records owners of the release of data and that the company will resume normal data retention and destruction processes. alone would have cost us thousands for a private lawyer to create. We had them reviewed by a lawyer in the business and he made the statement that, ’these are very good contracts and are very well done throughout’." 1. Get Proposal Kit Professional that includes this business contract document. This Release of Legal Hold Notice Form is included in editable Word format that can be customized in Word or by using the included Wizard software. Once you have ordered and downloaded your Proposal Kit Professional you will have all the content you need to get started with your own formal declaration. Records Custodian's Name or Department: Insert name of record keeper. Case ID Number: Contract Reference Number. Release of a Legal Hold. This is to provide notification to the records owners/departments of the release of data and Company Name will resume normal retention and destruction processes. If records were scheduled for destruction during the litigation hold period the records department will proceed with the destruction process outlined in the Records Program Policies and Procedures. List of records that were under legal hold for specified owner or department. Data Owners Name Content Description Data Collection Site (file share, mailbox, backup, workstation, smart phone, etc.) Data Custodian's - Network and/or Physical Location (mapped drive, file cabinet). Requires signature of the department or records owner for acknowledgement of the notification. 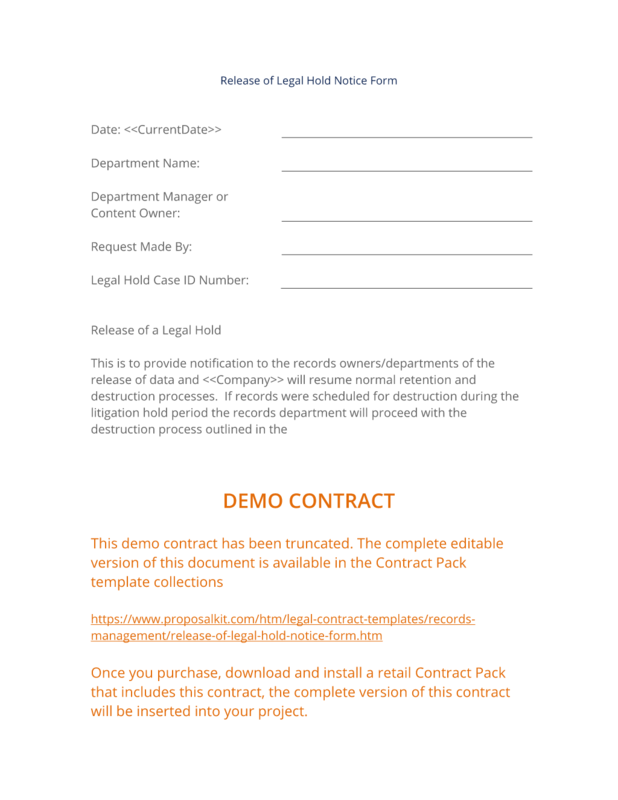 The complete Release of Legal Hold Notice Form - with the actual formatting and layout - is available in this Contract Pack.